Dec 1 how to roast garlic. and why you will want to. Once you roast garlic you will never go back. It will be something you just have to do once in awhile---if just for the aroma. I roast garlic to put into mashed potatoes, to make Tuscan White Bean Crostini and to tuck onto an appetizer plate next to a wedge of Cambazola. I just said 'yes' to teaching a one hour class to a room of professional women---their well-earned lunch break. Guess what the topic is? Easy to assemble appetizers for the holidays. There will be no oven, no kitchen facilities and honestly these hard-working women simply need some great go-to appies for the holidays. Which is where I come in. And bring roasted garlic. This will be just one of approximately 10 appetizers I plan to present. On a fancy plate: 2-3 heads of roasted garlic, a generous wedge of Cambazola cheese and really good artisan bread. You can use rosemary bread or something from a nearby bakery---even a baguette will do the trick. Slice into smallish pieces and serve next to roasted garlic and cheese. Just for show: I often drizzle some extra olive oil over the garlic right on the plate. 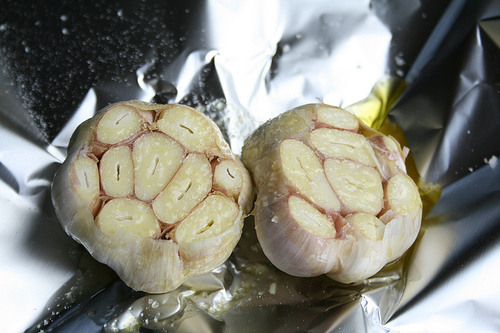 Peel off a few layers of garlic skin, then 'top' them by cutting off 1/3 inch off the pointed end of the garlic. Place on foil. Drizzle/lube with olive oil. Sprinkle with kosher/coarse salt. 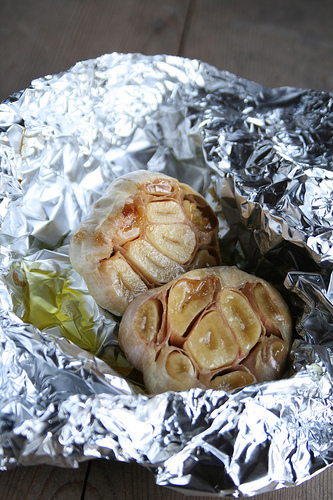 Wrap completely in foil, place in 350 degree oven for 1 hour. For smashed potatoes, crostini or mixing into stuffing: squeeze out cloves like you are squeezing a tube of toothpaste and add to blend. 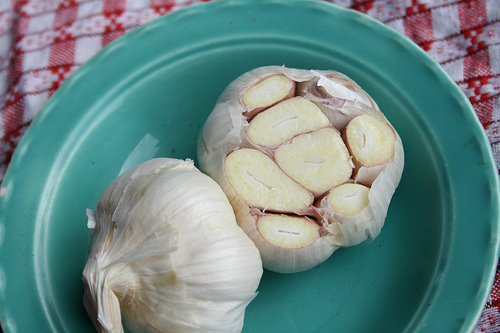 Roasted garlic keeps in your fridge for up to a week. Though mine never lasts that long.